Synthetic peptide conjugated to KLH derived from within residues 100 to the C-terminus of Human Myosin Light Chain 2. Our Abpromise guarantee covers the use of ab79935 in the following tested applications. 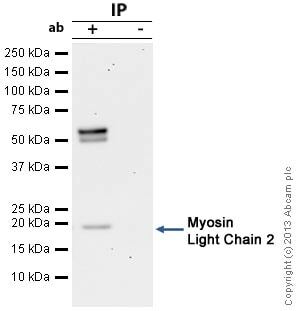 ab79935 staining Myosin Light Chain 2 in Mouse embyronic (e18.5) cardiomyocytes by ICC/IF (Immunocytochemistry/immunofluorescence). Cells were fixed with paraformaldehyde, permeabilized with 0.5% Triton X-100 and blocked with 1% Serum for 1 hour 30 minutes at 20°C. Samples were incubated with primary antibody (1/140 in 1% goat serum + 10% BSA + 0.1% Triton X-100 in PBS) for 16 hours at 4°C. An AlexaFluor® 594-conjugated Goat anti-rabbit IgG (H+L) (1/200) was used as the secondary antibody. Myosin Light Chain 2 was immunoprecipitated using 0.5mg Mouse Heart tissue, 5µg of Rabbit polyclonal to Myosin Light Chain 2 and 50µl of protein G magnetic beads (+). No antibody was added to the control (-). The antibody was incubated under agitation with Protein G beads for 10min, Mouse Heart tissue lysate diluted in RIPA buffer was added to each sample and incubated for a further 10min under agitation. 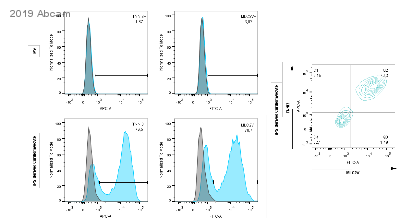 Proteins were eluted by addition of 40µl SDS loading buffer and incubated for 10min at 70°C; 10µl of each sample was separated on a SDS PAGE gel, transferred to a nitrocellulose membrane, blocked with 5% BSA and probed with ab79935. IHC image of ab79935 staining in Mouse Heart formalin fixed paraffin embedded tissue section, performed on a Leica BondTM system using the standard protocol F. The section was pre-treated using heat mediated antigen retrieval with sodium citrate buffer (pH6, epitope retrieval solution 1) for 20 mins. The section was then incubated with ab79935, 5µg/ml, for 15 mins at room temperature and detected using an HRP conjugated compact polymer system. DAB was used as the chromogen. The section was then counterstained with haematoxylin and mounted with DPX. Additional bands at: 17 kDa, 8 kDa. We are unsure as to the identity of these extra bands. Gate was created using the same cells maked only with secondary antibody. Cell harvesting/tissue preparation method: Cells were haversted after trypsin digestion for 10 min and blocked with 10% FBS. After wash with HBSS, cells were fixed with 1% PFA. Sample buffer: Cells were kept in HBSS until blocking with HBSS + 0,2% saponin + 3% dry-milk. Washing solution consisted in HBSS + 2% saponin+ 1% BSA.